After three years of sipping, spitting, and slogging her way through bushy vine leaves and cellar cobwebs, award-winning writer Natalie MacLean takes listeners behind the scenes of the international wine world, exploring its history, visiting its most evocative places, and meeting some of its most charismatic personalities. In Red, White, and Drunk All Over, Natalie travels to the ancient vineyards of Burgundy to uncover the secrets of the pinot noir, the "heartbreak grape" from which some of the most coveted and expensive wines in the world are made. She visits the labyrinthine cellars of Champagne to examine the myths and the mystique of luxury bubbly and the grandes dames who made it the drink of celebration the world over. She pulls on sturdy boots to help with the harvest at the vineyards of iconoclastic Californian winemaker Randall Grahm and goes undercover as sommelier for a night in a five-star restaurant with a wine list the thickness of a phone book. She looks at the influence of powerful critics, notably Robert Parker and Jancis Robinson, invites listeners into her dining room for an informal wine tasting, and compares collecting notes at a bacchanalian dinner with novelist Jay McInerney. As funny and engaging as she is knowledgeable, Natalie has an unconventional wit, curiosity, and obsession with all things related to wine that make for a tour both amusing and informative, from grape to bottle to glass. 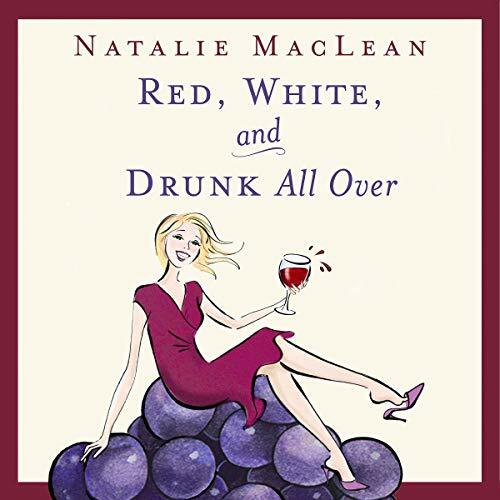 Before I listened to Natalie's book, I was never sure how to pick a wine in the liquor store. I felt overwhelmed with all those bottles. But she makes wine so much fun with hilarious stories and weird winemakers. I love, love, love that she's reading her own book - she has a great voice ... I feel like I'm right there with her as she takes me around the world on the best wine trip ever! Now I just march into the liquor store, and grab a bottle off the shelf ... and it's good stuff! This was great book to listen to! The journey that Natalie takes you on is fun and you come out learning some great things about wine! I loved this book! A fun collection of stories that combine entertainment and education. I recommend this to anyone looking to learn about wine in an enjoyable way. For a book about wine, the author seems to have run out of steam about 3/5th of the way through. The interview with Jay McInerney was a particular low. I lost track of time with this book! So many great stories here ... she kept me listening the whole way through. The bonus - some awesome food and wine pairing advice for what she calls "the problem children" of the food world (cheese, chocolate, veggies, fast food, spicy food). She made me thirsty for wine and learning more about it!